I’ve been having a hard time figuring out what day it is 🙂 I just double-checked and it is, in fact, Tuesday. So, that’s settled. I’ve been trying to get up at 6:00 so I have an hour to shower and do my Bible reading and have a little quiet time before the kids get up at 7:00. 6:00 has felt so very early the last two days, but I’ve been able to drag myself from bed and I’m always happy later that I got moving before the kids. Yesterday I promised Ethan that we would ask his friend from tutorial to go to the pool with us. So, I had to track down their phone number today. I had all but given up and told Ethan I couldn’t find the folder with the phone numbers in it when Ethan ran upstairs and immediately found it! That is one determined boy 🙂 We met up with his family at the pool this afternoon and quickly discovered that there was a swim meet happening. We did plan B and went inside to the indoor pool. Ethan had a fabulous time with his friend and I had a nice chat with the mom. After our pool time, we changed and ran to Brentwood to bring a meal to a co-worker of Nathan’s. He and his wife just had a their first baby on Sunday. This evening, Nathan is enjoying a well-deserved guys’ night. The kids and I are veggie out with Netflix. The flower garden desperately needs to be thinned out and get some extra TLC next year. I am enjoying the color though! Hope you are all enjoying your last day of June! Today we are back to normal life. Getting caught up on laundry. Nathan is happy to be back at work. Ethan has been. . . . reading Charlie and the Chocolate Factory to his siblings. Audrey has been. . . tending to her flower garden. It is still looking great! Nothing makes you appreciate your own bed quite like travelling for a week and a half! We left for MN on Thursday evening, the 18th. We stayed in Effingham, IL that night. The next two nights we were in Winona, MN for our Henning reunion. The next three nights we were at Brian and Missy’s house and the three nights after that, we stayed with Dad and Joyce. And, finally, last night, we were in a hotel again on the way home to TN. 10 nights away from my bed. It was good to see family. We had a good time. Our kids were thrilled with seeing their cousins and second cousins and extended family. There are pretty tired out from the travels though. Audrey was so tired this afternoon and she was having a little emotional break down. So, Nathan intervened and convinced her to rest for a while. What will I do when teen angst hits in full force?! Have mercy. We were home for less than a hour before the neighbor kids were asking to come over. I guess they missed our kids! Friday- drove to Winona, MN. Met up with the Hennings. Saturday- Henning Family reunion in Winona. We swam in the pool at the hotel, played games, played at the park, played at another park and had some fun competition in the “Henning Games”. Sunday- Said, “goodbye” to our aunts and uncles and cousins and their kids. Headed to Cottage Grove. Celebrated Brian’s birthday and Father’s Day. Monday- Went to see “Inside Out”with Brian and Missy. Hung out with them and played games and made s’mores! Tuesday- More time with Brian and Missy. Thursday- More time with Dad and Joyce. Friday- Went to see Tim and Erica and family in the late afternoon/evening. Saturday- Headed back to TN. 9 hours of driving for that day. Sunday- Finished our trek back to TN. 5 more hours of driving. And now I shall happily stay home with no plans of anything exciting for a few days! Author amyPosted on June 28, 2015 Categories family3 Comments on We’re Back Home! Nathan has a new article that was published today. Yay! He tells about how he got his start and what we are doing to help our kids learn about programming. I love it! Nathan took the photo. We spent a happy afternoon in the sun. Nathan and I went to see a musical at the Franklin Theatre last night. I had seen an article about this upcoming production and decided it sounded like a fun thing to go and see. It is the year 1942 in the small town of Franklin, TN. Pearl Harbor has just been attacked most of the men are off to war. The people left in Franklin are stuck in a depression, both economically and physically. Many children are orphaned and alone. A group of those orphans find shelter in the old abandoned Franklin Theatre. Their leader is Daniel, a 20 year-old who finds his place fathering these children as his own. Though destitute, they have become family and have grown accustomed to their unconventional lifestyle. Until one day, everything changes. With the hopes of renovating the theatre to bring more money in, the owners, Margaret and Clive Roberts, along with their 17 year old daughter, Sarah, move to town. Sarah is on her way to becoming a professional ballerina and being taken away from her dancing, is less than thrilled to be moving out of the city. But, she finds that Franklin may just hold the key to her dreams. So, our youngest is 6. Having the youngest child turn 6 is so different than when the first born reaches that age. They have all grown so fast. We had a fun day celebrating Isaac. Cupcakes, a special breakfast, new toys to play with. . . life is good when you are 6. My kids were so sweet today. They had been looking forward to my birthday. Ethan had planned to make sure that everyone slept in, but then I got up early and foiled his plan to have me sleep late. They took goo care of me today. So did Nathan. Here’s to another year of adventures! 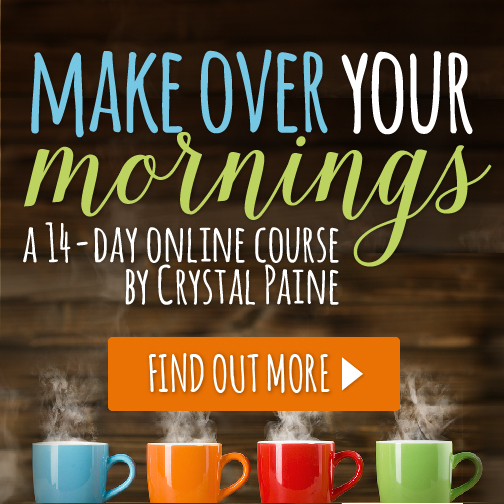 I’m so excited to check out Crystal Paine’s new program that she just launched today – Make Over Your Mornings! So, for my birthday, I’m going to kick off using this new 14-day course. It’s super easy and looks like fun. These are all things I could use more of in my life. Maybe you could use some too? I’ve been following MoneySavingMom online for a while and I know that she is committed to offering high quality products to people like me (and you) who want to make the most of our money. Check out the Make Over Your Mornings course here. Or you can click on the following banner.